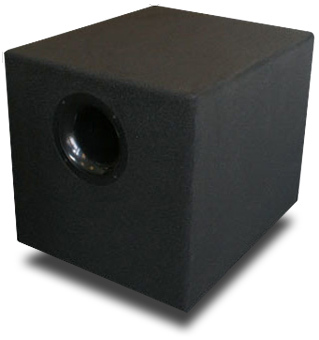 Much has been written about the pros and cons of satellite-subwoofer speaker systems. On the pro side are the advantages of smaller, less intrusive boxes in ones listening room, and the ability to use lower-powered amplifiers and still get big sound. On the con side is the possibility that the sub and satellites wont interact well, resulting in significant deviations from smooth low-frequency response. Of course, with the advent of crash-boom-bang movie soundtracks, a subwoofer is almost a requirement these days for a home-theater system. But subs can also play an active role in music-only systems, such as my own. So I was pleased when I was asked to review Elemental Designs A6-6T6 tower speaker system (review in the works) and their A2-300 subwoofer ($350 USD). Elemental Designs is a relatively new name on the audio scene. Founded in 2002 by students at the University of Northern Iowa in Cedar Falls, just outside Waterloo, by 2006 the firm had grown to the point that it needed to move to a 10,000-square-foot space in Newton, Iowa (hometown of Maytag -- both washing machines and blue cheese). While Elementals initial emphasis was on car audio, theyve now introduced a line of home audio speakers and a staggering array of subwoofers. As is fairly common these days, Elemental sells its speakers solely via the Internet. However, the firm has what seems to me to be a unique way of doing business. Marketing director Brett Bell suggests that, instead of purchasing blindly, the would-be customer call and review his or her room and equipment with one of Elementals Sales Support Agents, to ensure that the right system is ordered. Then, once the gear has been delivered, Bell recommends another call to help with speaker and sub placement. To this end, neither sub nor towers come with any kind of owners manuals, although Bell said that the company is considering producing some. The A2-300 is a beast measuring 18" wide by 18" high by 21.5" deep and weighs a considerable 72 pounds. The 12" driver fires downward, and on the front panel is a 4.75"-diameter flared port. The manufacturer-rated 250W plate amplifier and all the connections are on the rear panel. The A2-300 is finished in matte black; according to the Elemental Designs website, the company does all its own woodworking, and each unit is run in at the factory before shipping. The controls are fairly extensive. A three-prong IEC power connection is found at the bottom, with a power switch next to it. Across the top are controls for level, bandpass frequency, and phase, as well as speaker- and line-level inputs and outputs to the satellites. Unlike most subs with which Im acquainted, the A2-300s phase control is continuously variable from 0 to 180 degrees, rather than a toggle between those two values. Like most powered subs today, the A2-300 reverts to standby mode if not fed a signal for 10-15 minutes. For this review, my main system consisted of a Dual CS5000 turntable with Grado Gold cartridge, a Sony X303-ES CD player, a Magnum Dynalab Etude FM tuner, and an Akai GX-620 reel-to-reel tape deck, all feeding a Linn Majik-IP integrated amplifier, with the Elemental Designs A6-6T6 tower or my NEAR 50Me Mk. II tower speakers. Interconnects were a combination of Linn, Straight Wire, and Dayton Audio; speaker cables were 14-gauge AR. 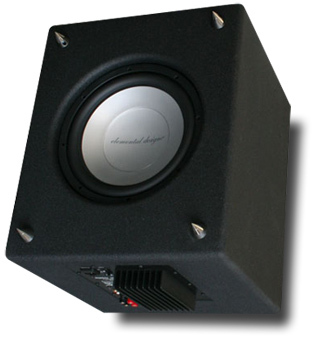 The Elemental Designs A2-300 was inserted in the circuit between the Linn and the tower speakers. My listening room measures 11 x 17 x 7. I placed the A2-300 between the towers, about 5.5 from my listening position and about 18" out from the front wall. The subs driver fired down at my rooms cork floor. I found that with the Elemental towers, the subs level control needed to be at its 3 oclock position or higher. The bandpass/crossover control was set at 1 oclock, the phase control at 0. I began by checking the A2-300s bass extension in my room. I disconnected the towers but left the subs level, bandpass, and phase settings as if the towers were still in the system. I then fed the sub warble tones from a test CD. Then, placing the somewhat flaky but ubiquitous RadioShack SPL meter at my listening position, I tracked the variations in the bass response. In my room, there were bass bumps at 80 and 63Hz (+2-3dB, compared to 100Hz), while the bass response fell off gradually and smoothly below that, down to 31.5Hz. The levels at 25 and 20Hz were noticeably lower, both to the meter and to my ears. Its my feeling that the A2-300 would offer more extension in a bigger room. I then played some bass-heavy tracks using only the subwoofer. If youve never tried that, it produces some eerie effects -- disembodied low bass that comes from everywhere and nowhere at once. But some interesting facts came to light. First was an old favorite, Fourplays "Bali Run," from their first, eponymous album (CD, Warner Bros. 26656-2). Nathan East digs deep on his five-string bass, with percussive strokes on the lowest strings. The A2-300 performed quite well, giving a palpable sense of Easts vigorous playing. Reinserting the Elemental towers in the circuit was satisfying, indicating to me that the sub and towers integrated with each other very well. Out of the stacks came an old collection, The Perfect Bach, for the Toccata and Fugue in D Minor, performed by Fernando Germont in a good remastering, with very little tape hiss, of this 1960 analog recording (CD, Angel 5 67728 2). The A2-300 reproduced the pedal notes strongly without breaking a sweat. When I added the Elemental towers, I noted a little overhang -- as if the towers, the sub, or all three couldnt quite let go of a note or chord all at the same time together. However, this was to a very minor degree, and may have had more to do with the acoustics of my room than with the speakers themselves. Having proven to my satisfaction the A2-300 could perform well by itself, I left the towers hooked up and listened to some more favorite tracks. "You Can Call Me Al," from Paul Simons Graceland (CD, Warner Archive R2 78904), contains considerable low-frequency energy, especially from the drums. The combination of the Elemental towers and sub provided good reproduction of these, as well as of the short bass solo two-thirds of the way through this song. For Maureen McGoverns "Are You There (With Another Girl)," from her Baby, Im Yours (CD, RCA Victor 60943-2), I switched over to my reference NEAR 50Me Mk. II speakers. This required that I turn the A2-300s level control down, as the NEARs are somewhat less efficient than the Elemental towers. What I found was that the A2-300, rather than extending the bass performance of the NEARs -- which are claimed to extend down to 31.5Hz -- as they had the Elementals, instead supplemented it: the bass and drums had an extra solidity that I found appealing, although it was necessary to do some fine-tuning of the phase, crossover, and level controls to hold down any boom. Finally, I listened to Bachs Little Fugue in G Minor, as orchestrated by Leopold Stokowski and performed by the Cincinnati Pops under Erich Kunzel (CD, Telarc CD-80338). Theres not much call for a sub for the first half of this arrangement, which is developed mostly in the winds and high strings. But finally the bass viols come onboard, and then the A2-300 did itself proud: The timpani stroke near the end was reproduced very well. Again, coupled to the NEARs, the sub seamlessly supplemented the bass line, although when I played this track again, this time without the A2-300, the subs absence was noticeable. Theres nothing flashy about the Elemental Design A2-300 subwoofer. Although its size and mass made it not my favorite component, I imagine Elementals staff could help you find a place for it in a home-theater system where it wouldnt dominate the room. It has smooth response and handles most bass energy with aplomb. If its size and weight dont put you off, its one heck of a great value.